Yerba mate, also known as Paraguayan tea, is obtained from the leaf of a flowering, evergreen tree that is native to South America and related to the common holly. Traditionally, the tea is prepared by placing the dried leaves of the tree inside a hollowed gourd called a mathi and then pouring hot water on top. Once infused, the beverage is sipped through a tube called a bombilla. Although the herb wasn’t formerly documented until 1822, yerba mate has been in use by South American indigenous people for centuries and remains an important economic crop for the region today. Ilex paraguariensis is a member of the Aquifoliaceae family. Yerba maté starts as a shrub and then matures into a tree growing up to 15 meters (49 ft) tall. The leaves are evergreen, alternate, coriaceous and obovate with a serrate margin and obtuse apex. The inflorescences are in corymboid fascicles, dichasiums of 3 to 11 flowers are male, female are of 1 to 3 flowers. Flowers are small, simple, numbering 4 to 5 with whitish corolla. Maté blooms in the fall from October to November and is pollenated by diptera and hymenoptera insects (entomophilous). It bears fruit from March to June; the fruit is a red drupe 4–6 mm in diameter. The leaves are often called yerba (Spanish) or erva (Portuguese), both of which mean "herb". 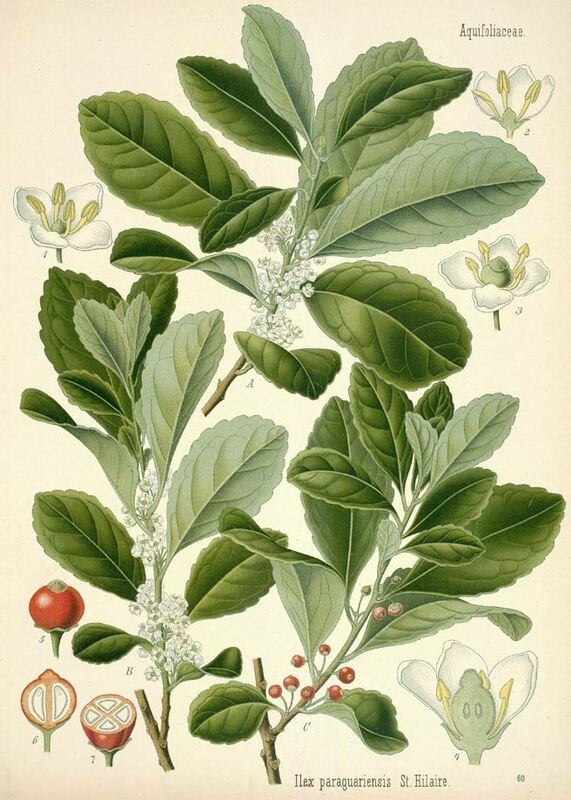 Ilex paraguariensis is native to southern Brazil and Paraguay, and with European colonization, yerba mate became more widespread. The yerba mate plant grows wild in warm temperate and tropical climates—generally near streams. Prefers a rich, moist, well-draining soil. Seeds that are harvested to germinate new plants are collected from January until April only after they have turned dark purple. Once harvested, the collected seeds are submerged in water in order to eliminate floating non-viable seeds and debris. New yerba santa plants are started between March and May. For plants established in pots, transplanting takes place April through September. Plants with bare roots are transplanted only during the months of June and July. 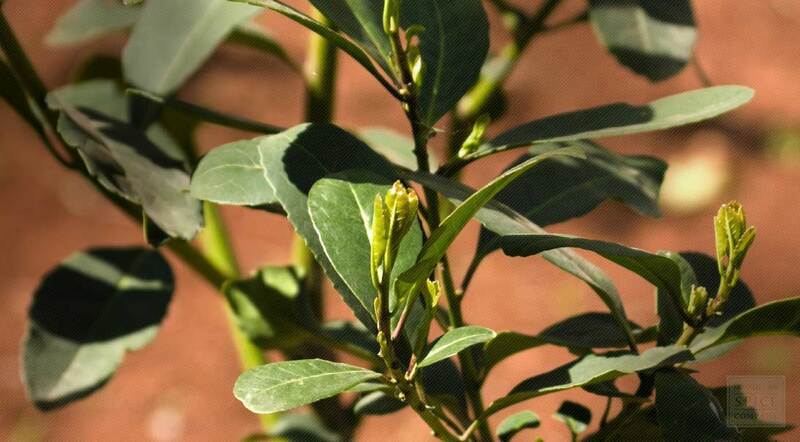 The leaves of the yerba mate tree are ready to be harvested when the tree is 4-6 years old. Harvesting is done only once every 2 years, and in a rotating system, where only a part of the plantation is harvested at a time. This system provides a constant supply of leaves and gives the yerba mate trees 2 years to replace the growth lost during the pruning. Leaves are dried for later use. Store dried yerba mate leaves, cut pieces in an airtight container in a cool, dry place. Mate' (pronounced MAH-tay), also called yerba mate' or Paraguay tea, was introduced into the United States in the 1970's as a noncaffeine coffee subsititute. That claim was in error. Mate' contains caffeine. It also contains vitamin C, making it more nutritious than other caffeine-containing herbs (coffee, tea, kola, cocoa). The Jesuits introduced mate' to European colonists, and today it is one of South America's favorite stimulants. In Argentina, Paraguay, and Uruguay, it's considerably more popular than either coffee of tea. More than 200 brands of mate' are currently marketed in Argentina alone. Argeninians consume 11 pounds per capita of mate' annually. In Uruguay, the figure is 22 pounds. South American breads often have mate' added, and the herb is a key ingredient in a popular South American soft drink. A 6-ounce cup of mate' contains about 50 milligrams of caffeine, about as much as a cup of tea or a can of cola soda. Instant coffee contains a little more caffeine (65 milligrams per cup). Brewed coffee contains two to three times as much (100 to 150 milligrams per cup). Some experts recommend vitamin C for colds. The herb is fairly high in vitamin C and is in fact the most nutritious stimulating beverage. Drinking mate' when you have a cold will provide one additional source of vitamin C.
For an infusion, use 1 teaspoon of dried herb per cup of boiling water. Steep 10 minutes. Drink up to 3 cups a day. Some people object to mate' odor, although others learn to enjoy it. Add honey and lemon if you need to.